Hope sits quietly observing five year old Reanna counting and labeling beads on the 1000 chain. Then she remembers she has the United States of America puzzle map out from the day before. She is anxious to return to her work. She traces the state of California on pink construction paper, punches out the shape with a pin, and glues it onto her map paper. She stops for a moment to look at her paper, exchanges a few words with Angie, who is sitting next to her working with the stamp game, and then proceeds to follow the same steps with the state of Montana. While working on her map, Hope pauses a moment to look around the room. She notices 3-year-old Jimmy struggling to roll up his rug. She offers to help him. He agrees and she takes one side of the rug. They slowly roll the rug together. Jimmy puts his rug away, and Hope goes back to her work. She completes the last state and sits back to admire her work. A friend walks by and notices Hope’s finished map. “Wow!” the friend exclaims. “You finished your map!” Hope rolls her map carefully and puts it in her drawer. She puts her puzzle map, scissors, pin, and pencil away. She then washes her table that was tacky from the glue. Hope feels hungry. She goes to the snack table where she finds plates, a bowl of strawberries, tongs, and a small card with the number 4 written on it. She asks a friend, Brandon, to join her. They each wash their hands, put 4 strawberries on their plates with the tongs, and pour water from a small pitcher into their cups. They sit at the table eating and talking. When they finish, they wash their plates, sponge the table, and sweep the floor, leaving the snack area clean and ready for another group of children to use. The snack will remain set up for the rest of the morning work time. 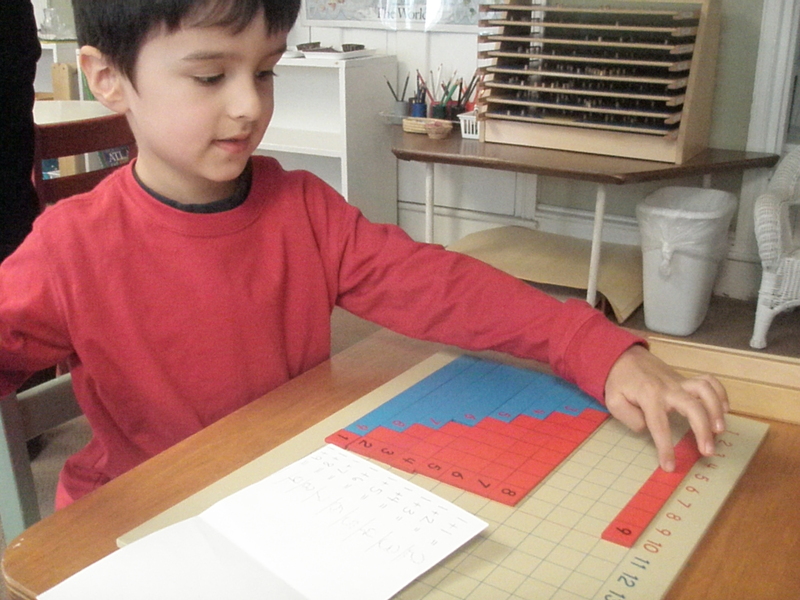 Hope collects the golden bead material to do some static addition. She invites her friends Julianne and Faith to join her in this work. 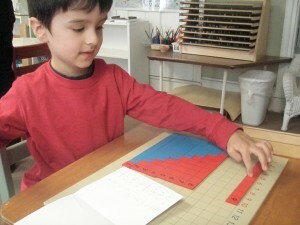 They add numbers utilizing units, tens, hundreds, and thousands, using concrete bead material. At the same time, a group of children leave the classroom to go to Music class where they will play rhythm instruments, sing and dance. The teacher rings a bell to signal clean-up time. Hope and her two friends clean up their golden bead materials and join the teacher and other children at the circle. The teacher calls the children two at a time to go to the bathroom, put on their coats, and line up to go outside to play. Reanna plays soccer with the five year olds on the field. Jimmy and his two friends help a teacher cut flowers from the garden for flower arranging. The rest of the group enters our spacious, tree lined playground. They play tag, hula hoop, and kick balls. While swinging on the monkey bars, some of the children sing a song that they learned during circle time. “We love this song,” they call out to their teacher. The teacher calls the children one at a time to line up to go outside to have some more fun on the playground. Outside, a teacher helps two children plant seeds in the garden, several friends dig in the sandbox, and a group of pays and girls play soccer.